We look forward to seeing everyone on Sunday, May 5th, 2019! Spencer Martin was a long-time, devoted volunteer whose work still inspires us today. 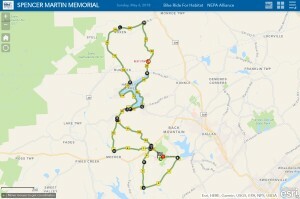 On Sunday, May 5th, the 35 mile bike ride will wind its way through the scenic Back Mountain. Beginning at the Penn State Wilkes-Barre campus at 9:00 am, cyclists will ride to help us continue our mission to eliminate poverty housing in Wyoming Valley. Pre-register by April 15th and pay $30. After April 15th, the entry fee is $40. Each registered participant receives a free t-shirt, a cue sheet with detailed directions, rest stop, snacks, and sag service. Course closes promptly at 1:00 pm. This is a rain or shine event! All riders are encouraged to carry identification, emergency contact information, and a cell phone. A Sag wagon will provide water, road assistance and transport to those unable to finish. Please be prepared to handle your own flat tires and minor repairs. The use of Ipod’s, earbuds or MP3’s while cycling is prohibited. Proceeds from the Bike: Spencer Martin Memorial Bike Ride for Habitat 2019 will be used by Wyoming Valley Habitat for Humanity to help provide simple, decent, affordable housing for qualified families within Wyoming Valley. This is an OPEN COURSE, please observe all the rules of the road. 1. All cyclists must wear a helmet. 2. Be considerate to motorists. 3. Ride no more than 2 riders side by side. Single file on narrow roadways is best. 4. Stay as far to the right of lane as possible. Refreshments will be provided at the finish area.